The local prosecutors' office told the paper that it had opened an investigation into racial discrimination. The video inside the restaurant appears to have been covertly filmed by one of the women, who were clearly emotional. Government Minister Laurence Rossignol said that she had asked Dilcra, a government anti-racism body, to investigate, describing the behaviour as "intolerable". A court ruling on Friday overturned France's controversial burkini ban on civil liberties grounds, but some local authorities have vowed to keep it in place. 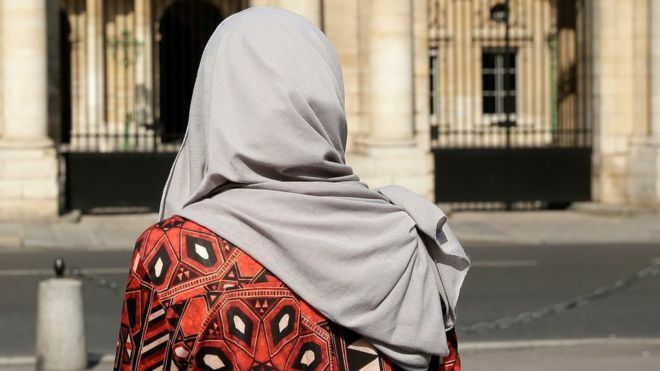 French anti-Islamophobia organisation CCIF said that "following the umpteenth Islamophobic incident which... led to the humiliation of two young Muslim women" its director would be speaking outside the local mosque on Sunday evening. The CCIF, which says it is offering legal and psychological support to the two young women, appealed for no protests outside the restaurant itself.